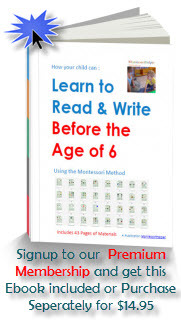 Montessori Articles » Montessori How To » You do not have to be a Genius to get this.. The example below of how a child would abstract the knowledge of the continents is exactly that, an example. It is intended to explain the concept in a practical way, and to help one understand the process of abstraction. It should also indicate why starting a child with a concept at too abstract a level can reduce the ability of the child to “learn through the senses” and fully internalise that knowledge in the fullness of time. In Maths for example, concrete concepts are most often the building blocks of abstract mathematical principles and quite often a child is taught the abstract principles only, without having the opportunity to comprehend the concepts at a more concrete level initially. This is becoming an ever more common modern issue caused by too much unguided computer interaction at too early an age. The child needs to work through the “discovery” process spontaneously before fully internalising and grasping the knowledge, and the directress needs to guide that process without being prescriptive. See the five step example below.. The child begins the journey of discovery at this point. The Sandpaper globe is a round physical globe with sandpaper continents that feel rough to the touch and thus predominantly stimulate the child’s tactile senses. This activity is primarily concrete in nature. The child begins the next step of discovery at this point. The Planosphere is no longer a round physical globe, but a two dimensional puzzle with continents represented by coloured puzzle pieces. This activity is less concrete and more abstract. Note the globe has now changed from a 3 dimensional object to a 2 dimensional object. This is abstraction of Activity 2. The child begins the next step of discovery at this point. As computers were not commonplace at the time that Montessori wrote her methods, it is suggested that this step is not “purist” Montessori. It is however, an optional additional step which can be considered in the context of our modern technological environment. The same principles as mentioned below would still apply. The child is now abstracting continents simply by their shape and colour regardless of other physical characteristics such as dimension and context, and within a virtual (non physical) way. The child has moved from objects in context (i.e. the globes and the planosphere) to recognising the continents without context (the nomenclature cards), to recognising the objects without context and direct physical interaction. This is abstraction of Activity 4. Abstraction is just one aspect of the Montessori Method, which is detailed and multi-faceted, and it is suggested that when applying the Montessori Method, the practitioner familiarise him/herself with the Method either through training or reading about it, in order to improve the outcomes and learning of the child. With all Montessori interactions it is important to consider and understand the purpose of them, and to observe and guide the child in accordance with the purpose. The child will spontaneously abstract ideas if he or she is allowed to, by virtue of the environment and elements within it…and by careful and purposeful planning which is the key role of the Montessori directress or Montessori Parent. The child turns away spontaneously from the material, not with any signs of fatigue, but rather as if impelled by fresh energies, and his mind is capable of abstractions. At this stage of development, the child turns his attention to the external world, and observes it with an order which is the order formed in his mind during the period of the preceding development; he begins spontaneously to make a series of careful and logical comparisons which represent a veritable spontaneous acquisition of “knowledge.” This is the period henceforth to be known as the period of “discoveries,” discoveries which evoke enthusiasm and joy in the child. Your Program is good but the problem is how to subscribe as money transfer may be cumbersome. Can you let us know what you are having trouble with. You can pay by PayPal or credit card, so are you looking for another payment option perhaps ? please I need a curriculum for 0-3years, can I get it from you. We are working on a 0-3 Lessons and Materials option that will include a curriculum.